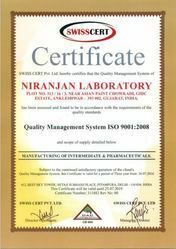 Established in the year 2010, Niranjan Laboratory has emerged as a renowned manufacturer of Chemical Products like Cosmetic Chemicals, API Intermediate, Water Treatment Chemicals and Bronopol Chemical. We are based in Gujarat and we are envisioned to conquer wide market segments across the nation. Our products are highly appreciated on large scale for their superior quality and effectiveness. This success is due to the significance we apply in processing our chemical under the strict supervision of expert professionals. These chemicals are supplied to various pharmaceutical, consumer products firms and other lab centers for various treatment purposes. We are backed by a competent team of experienced and diligent workforce including subject matter experts. Our quality initiative includes awareness on all tiny details both during the processing and supplying our products. Our infrastructure is highly advance and equipped with best lab facilities and all essential testing equipment. We collect the best raw materials from authentic dealers and process them with full caution. Furthermore, our ethical and decent policies also enable us to maintain high competence level in our business. With the initiative of our mentor Mr. Jagdish Ramoliya, we have been constantly achieving a highly consistent and successful position in the market. His high level of dedication and efforts has helped us to stand ahead of the other competitors in the market. Being a proud firm, we have hired with us an excellent team of professionals who are proficient and enthusiastic. All the experts working with us are hired only after passing the tough recruitment process. Hence, we have only sincere & talented individuals working in our organization. We also provide them proper training so as to enhance their skills and knowledge in particular domain. In return, we get the standardized level of performance from them which assists us in achieving our predefined industry goals. We have strictly informed to all our employees they all should perform each and every task carefully. We have started as a small entity in the market but now have become the well-known brand of industrial chemicals. To sustain this standard we strive every day to implant latest technological methods at our procurement base. Being attributed to our sound experience in the field we deliver excellence in our business operations and market deals. Our long run success is only due to international quality standards that we follow in the entire procurement process. Also, the broad range of products that we offer makes us apart from the other companies working in the same domain. One of the greatest strengths of the Niranjan Group is its ability to develop customized products. This policy of the Niranjan Group has helped to build close ties and mutual trust with customers globally, thus increasing world acceptance of its products. To delight the customer by continuously developing new products turned to evolving needs and maintaining the high standard of quality and efficiency in production and prompt delivery. Our sound infrastructure unit sprawls over a large area and has all sort of facilities comprises latest machines, testing labs, packaging unit, and spacious storage house. These units are divided into different segments that help us to bring out quality industrial chemicals in the shortest time possible. Also, our well-sectioned warehouse facility enables us to store a large amount of product with ease. Here all the finished products remain safe from rain, fire, and flood. Owning to these facilities at our base, we can meet urgent demands of clients in a fast and effective way. To become an integrated specialty chemical, intermediates and pharmaceuticals manufacturer with unique products range, technology-based products and strong footholds in both domestics and global markets. Promoting the use of modern technology and practices. Empowerment of the company''''s performing units. Nurturing and developing human resources. Most of the company of Niranjan Group are to acquire the ISO 14001 certification for its commitment to cleaner protection technology and Environment Protection.